Router monitors calls - no going over your limit! Wireless networking is more popular than ever and with such a wide range of Wi-Fi routers on the market, it takes something special for a product to stand out. 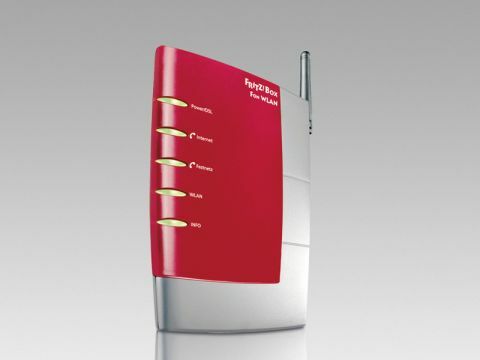 The FRITZ!Box Fon WLAN (£140 inc. VAT) succeeds by packing an array of features into a small and easy to set up unit. By combining a Wi-Fi and Ethernet router with a DSL modem and firewall, you can connect directly to your phone line for easy internet access. Your home phone can also be connected for making and receiving calls via your standard phone line or online VoIP services. All necessary Ethernet cables and DSL line splitters are included, along with a CD-based set-up wizard to help you get connected. The basic set-up process is simple, but you need to tweak some advanced settings for the best performance, which beginners may find confusing. Once connected, it's easy to set up a wireless network to share the internet connection with other Wi-Fi-equipped systems. To prevent unauthorised access, you can easily encrypt the Wi-Fi signal or disable it entirely and use the four built-in Ethernet ports for fixed access. A unique feature of the FRITZ!Box is the inclusion of a USB port for connecting and sharing printers and storage devices over your network. The built-in hardware firewall also provides an impressive online defence, blocking more than 95 per cent of intrusion attacks during testing. By connecting your home phone, you can switch to VoIP for global free or cheap rate calls. All calls are instantly logged by the router, so it's easy to monitor your call history, as well as see missed calls. A final feature ideal for home broadband users is the usage monitor, for keeping track of how much data you've accessed, so you don't exceed your monthly limit. Only the high price of the FRITZ!Box may deter some buyers, but this is an impressive home router.